At a powerfully built 6-foot-8 and 225 pounds, Jarvis Omersa might already look like he’s in college, but he still has another few weeks before joining the Gophers next month. Nobody would guess Omersa will be the youngest player on the University of Minnesota basketball roster this season. He won’t turn 18 until July 27. 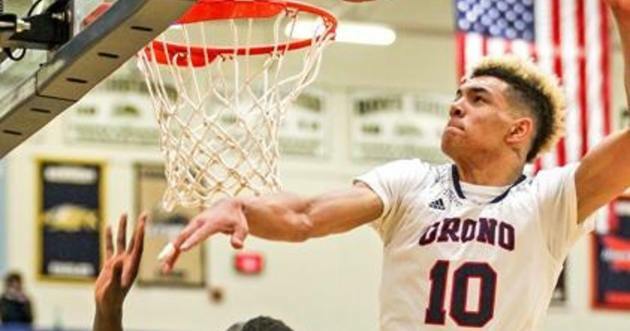 Gophers fans got a glimpse of what type of freak athlete Omersa already is from the dunk show he put on at the Howard Pulley Invitational last weekend. He teamed up with seniors from the area and former Pulley AAU members, including fellow U recruit Gabe Kalscheur. Omersa’s 40-inch vertical and 7-foot wingspan was on display with him flushing down lob passes and punishing the rim with windmills, 360s and a couple high rising slams off the backboard that went viral on social media. The highlight that got the most attention from a video on Twitter was his swooping alley-oop dunk on a pass off the backboard from teammate Calvin Wishart. Practicing against All-Big Ten power forward Jordan Murphy will “be really good for me,” Omersa said about when he joins the team this summer. Murphy is one of the most athletic players in the Big Ten, but Gophers coach Richard Pitino said Omersa will be the best athlete on the team. Omersa knows everyone will label him as a dunker coming into college, but he’s working on showing the Gophers he can be much more than that. He hopes to impact the game on both ends of the floor. Omersa, Kalscheur from DeLaSalle and Daniel Oturu from Cretin-Derham Hall make up the most anticipated recruiting class for the Gophers in almost a decade. The last time the U had at least three Minnesota natives in one class was 2009. Oturu and Omersa will be roommates this summer. Oturu, the top prospect in the class, is sidelined until the fall after shoulder surgery last month. Omersa said he and Kalscheur are sad to see Oturu won’t get to practice with them when they all start summer school in mid-June. The three freshmen, though, got to pick out their numbers recently. Omersa is No. 21. Kalscheur is No. 22. Oturu is No. 25. Competing for a starting spot in the frontcourt are goals for Omersa and Oturu. But all three freshmen feel strongly about the Gophers being able to turnaround from last season’s 15-17 record.